Validation is the the most important part of email management and communication, and it starts with you! We can't validate your Tradeloop membership application without a valid email address. Other members can't contact you either. An invalid or non-working email address can also lead to account suspension. We recently launched the Email and Report Center to give members a central location where they can manage emails, set email preferences, and more. Now, we've implemented more internal controls to validate email addresses when members register or create new sub accounts. 1. Only one email address can be entered into the email address field. We understand that many people use multiple email addresses, but each Tradeloop account and subaccount can only be associated with a single email address. 2. Emails must be in a valid format - like "yourname@yourcompany.com" not "yourname@yourcompany.com TL email." 3. Every subaccount must have a unique email address. Subaccount holders need this to upload parts lists and it also helps other dealers easily contact the right person in your company. Note that none of these validation routines checks to see if the email is actually working. Our Customer Service staff does that when they validate membership applications. Tradeloop's email system also keeps track of email bounces: too many bounces may cause your account to be suspended. Bounces also look suspicious to other dealers because so many fraudulent companies use disposable or incorrect emails. Avoid that problem by updating your Tradeloop account when you change your email address - or many any changes to your contact information. Never miss out on a hard-to-find item again! Tradeloop's new Saved Search feature automatically notifies you by email when someone uploads a part that matches your saved search. This feature replaces the old "Email Alerts" system which used to match "Want to Buy" lists to "Want to Sell" lists. The new system is much more efficient and easy to use. For instance, suppose you've purchased some refurbished Sony VAIO laptops and need 30 replacement batteries for them. A search on part number "DR5472" returns two results with a total of 16 batteries available. You still need more, so save your search by clicking on the "Save this search and Alert Me" link underneath the search bar. You'll be prompted to give your search a descriptive name. Once you save the query, we'll send you a notification email each time someone uploads that part. Search for a dozen parts or just one. Each part has its own Saved Search name and report. You can modify or delete your saved searches at any time just by going your "Account Information" page and selecting the "Email Center" link. From there, select the "Your Saved Search Alerts" option in the right-hand column. It takes you to your "Saved Search" report where you can change or delete saved searches. 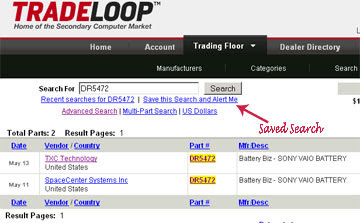 As you use the Saved Search feature to find the parts you need, remember that Tradeloop members can also receive alerts when someone else is searching for a particular part. Use the Search History feature to find new buyers or as a market research tool. Both features help you avoid time-consuming searches for buyers and sellers. Use the Search History to see what buyers are looking for, and let the Saved Search report help you find what you need! Searching the Trading Floor got easier and faster with the launch of a new layout and search results display. You'll notice the difference when you visit the search by Manufacturer page and category search pages. The Manufacturer search page still has the tag cloud at the top with the most popular manufacturers listed. However, we replaced the long, long list of manufacturer names underneath with a single search bar that displays the alphabet, A to Z. Each letter is a link that takes you to a results page for all manufacturer names beginning with that particular letter. This smaller page loads much more quickly and makes it easier for you to find a particular manufacturer - particularly those with names that begin with letters at the end of the alphabet! Instead of endless page scrolling, you can jump directly to the section you need. The Category search page has the same structure. You'll see the top manufacturers listed in a tag cloud at the top, with the alphabetical search bar underneath. And while you're on the Trading Floor, don't forget to take advantage of our recently-launched Search History page. It's a great market research tool that helps you see who's searching your inventory and all of Tradeloop too. Since our last Ethics Update, two non-member companies were banned from Tradeloop. Nazims Continental was banned for failure to ship goods after payment was received. Alken (HK) Trading Co. was banned for shipping counterfeit product and refusing to refund the purchase price. One complaint was closed with no action taken after the complainant failed to respond to requests for information. We want to remind members that that the Ethics Committee is composed of volunteers. Filing a complaint and failing to follow through wastes the committee's time and reflects badly on the complainant. Our two new cases have an unusual twist: both are between Tradeloop members! The majority of Ethics cases are filed by members against non-members. That's why we encourage members to seek out other members first when looking to make deals. Our careful member screening process helps keep fraudulent companies out of the trading community. In one new case, the complainant alleges that the defendant failed to pay for goods after product was received. That case is being prepared for Ethics Committee review. The second case alleges non-payment and failure to complete the purchase agreement. That case will go forward when the defendant responds to requests for information. Please remember that participation in the Ethics process is not optional for Tradeloop members. It's part of your membership agreement, and members who fail to participate can be banned from the Tradeloop community. Visit the Tradeloop Ethics area to read more about Ethics cases and the Ethics process.